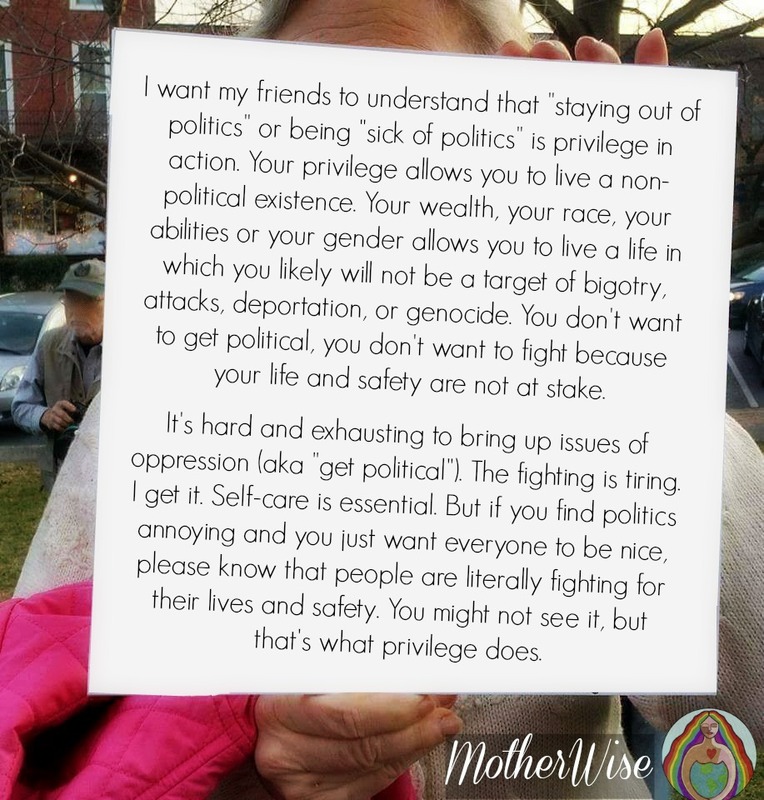 I want my friends to understand that “staying out of politics” or being “sick of politics” is privilege in action. Your privilege allows you to live a non-political existence. Your wealth, your race, your abilities or your gender allows you to live a life in which you likely will not be a target of bigotry, attacks, deportation, or genocide. You don’t want to get political, you don’t want to fight because your life and safety are not at stake. I also want to say to those of my friends who are new to this, those who have recently become more vocal, those who’ve seen the damage Trump and his clan have done so far, those who went to the women’s march — I am proud of you for getting involved. Don’t stop there. Keep having these discussions, keep talking about politics, stay active. And when you read the critiques of the march from other progressive women who didn’t feel represented, don’t get defensive or discouraged. Activism needs critique. We need to ask ourselves where we were as Flint’s water has been poisoned, or where we were when Philando Castile was killed, or John Crawford or Eric Garner or Charleena Lyles. If the women who showed up at the march would show up when people of color are murdered, it would stop. Intersectionality means showing up even when the issues don’t affect us directly. Stay awake and stay active. We need you so much right now. I am deeply grateful for your powerful post I saw regarding privilege. I read it as an empowering petition to people who are at a loss for how they can be part of a solution. I know you wrote it about our current frightening state of affairs racially. I am overwhelmed that such a young person “gets it.” I believe that many people need to learn more about the horror of slavery and post slavery in order to fully comprehend the American stain of racism. Thank you so much. This is great! Thank you! I will share!!! This should be posted everywhere, in every business, church, coffee shop…EVERYWHERE! Even if just one person gets it, it’s a beginning…thank you so much for posting this! I am sick of the political rhetoric. I can no longer discuss, intelligently and with concrete facts/data to back up my opions, without being insulted, personally attacked or just plain treated badly. Unfortunately, I’m trying to have an open conversation to gain understanding. I consider myself very open minded, but I insist on facts and actual bi-partisan data. We need to listen, but we also need to respect other people’s opions and try to gain understanding, as our beliefs are certainly shaped by life experiences. So, I have ‘opted out’ of ‘politics’. I will continue to serve as a mentor to at risk, underprivileged teens. I will continue volunteering at meals on wheels. I will continue holding babies at a crisis nursery. I will continue going to church to pray for the hate groups-praying for their hearts to soften. I am a white, educated, female, suburb living christian who might as well be the anti-Christ according to your article. Why are you taking this so personally? If it’s not about you, don’t make it about you. P.S. working with marginalized teens is a political act, so think again. She’s taking it “personally,” I think because you’re MAKING it “personal.” You are painting everyone with the same brush and making it seem that if someone lives a successful life and isn’t engaged politically that they are “privileged” so that is what is creating the problem … according to your poster above. You actually say that you might be blind to problems if you are “privileged!” It’s outrageous and not helpful. How have we moved beyond “lifting others” to trying to make it seem that NO ONE can be successful, safe, comfortable etc? I think you’re confusing the definition of privilege with… something else. A very simple definition would be that “privileged” means that a person or group has access to something that not everyone can access. It doesn’t mean you are rich, it’s not a comment about success or even about happiness, it doesn’t mean you’ve never struggled or have s perfect life. And it’s not to say that if you are privlidged you’re a terrible person or are guilty of racism. It’s not necessarily something to be defensive about, even if you do take it personally. At the very least its just something you should be aware of. What you do with that awareness is another matter. This seems to be a reading comprehension issue, Marty. I did not say or imply in any way that anyone should not be successful, safe, or comfortable. Quite the opposite, in fact. Did you even read this article? But the biggest problem IS the privileged people who do not see outside their bubble. The irony is they enjoy freedoms and a lifestyle because of the fights of many privileged people who cared and wanted to change the world. Not getting political = taking your privileges/lifestyle for granted (among other things). Nothing can guarantee though that your bubble won’t get burst. And your indifference and apathy is a weapon in the hands of the bad people. It is good to remember that the ‘us’ and ‘them’ talk whether it is hate speech or under the guise of trying to help the ‘down trodden’, keeps people down. No one should get special priveledge just for where they happen to be born. The speech needs to always be ‘we’, if things are going to be talked about politically or socially. If it is not ‘we’, people are forced to chose who they identify with, and who they are going to ‘bully’ for not being them. The hate speech that is coming out, supposedly, for political and social change is just that, hate, no matter whose mouth it comes from or what ‘noble’ thoughts may have inspired it. It comes out as ‘hate’ whenever negative things are said about a ‘them’ or a ‘he’ which has become very prevasive and plentiful. Hate speech against those in positions of responsibility or of people we judge to have some unfair advantage to inspire change is just as bad as hate speech of any person or group that is just trying to inspire hated. It causes the same undesirable result. Maybe neutral friends are smarter and more helpful to the solution of the issues than we may think. Do not stay silent in the face of racism and hate. Yes it’s “only” Facebook, however Facebook is a forum. It’s not just about martini photos, my children, and me dancing in the streets, (yeah there may be too much of that)… It’s about sharing your beliefs with those you don’t see every day or ever. Do you have friends that continue to support trump and his messages of hate, his cabinet of alt-right advisors? Perhaps you have friends that think “all” insert here what may be true for some of your friends and family…Muslims, Asians, Blacks, LGBTQQI, immigrants, Syrians, the poor, and on and on. They need to hear what you think. No you say, I don’t need to post that I feel angry about… Why not? Where do you share your philosophy? I dislike various people because they’re assholes, because of their racist/misogynist vocabulary, because they hold strong opinions that are based on lies, not because we disagree on facts. Of course many story has various interpretations. Some however are far narrower than others. There is no excuse for Nazi salutes, there is no excuse for racist slurs, there is no excuse for trumps “On many sides”, remark. 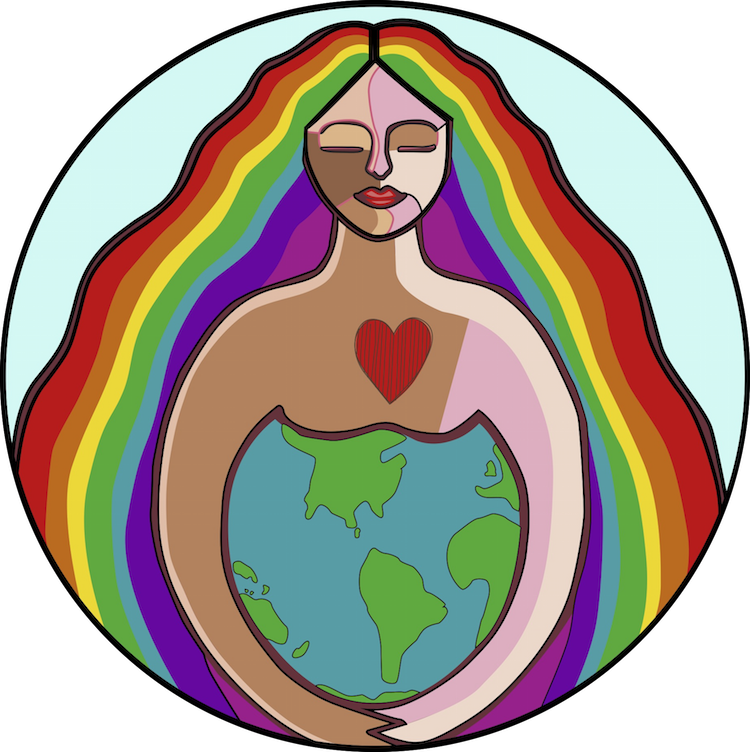 Don’t allow it to pass with an offhand, “ Well you know what he means…” Stand up for the rights of others as if they were your sisters, brothers, mothers, fathers, because they are. What is your point? We’re supposed to just know that if our lives are nice and safe and comfortable that that is NOT okay? Or … what are you saying? There are no answers or solutions in this statement. Just more finger pointing. Thank you, Marty! We’re supposed to feel guilty for just — being. I don’t have special “privilege” any more than anyone else does. Arguing with people on the Internet is a pointless endeavor that solves nothing. In fact, the constant finger pointing and blame throwing further incites trouble, it doesn’t mitigate it. You might not understand the concept of privilege. Do you think it’s important to inform yourself about a topic before deciding it doesn’t apply to you? This is a classic, arrogant response. If I don’t agree with YOU then I am the one who is uninformed. What about people who ARE informed and just don’t agree with your theory?? If you understood the scholarly theory of privilege, you’d be able to discuss it in an intellectual way. Instead, your reaction is emotional and bitter, because clearly the topic triggers something in you, and you are not emotionally intelligent enough to handle your feelings like a big boy. I did not say privilege “blinds” anyone. I did say that the ability to stay out of politics, find politics annoying, not get the point of protesting things like DOMA, etc. is a sign of privilege. MotherWise … you prove just what I said. You’re arrogant in your theory. I need to understand the “scholarly theory of privilege? ?” What is that scholarly theory? And it is simply a theory …which you are using as an attack on those who YOU are lecturing not to attack others. That’s arrogance. You don’t see that by telling others that they are blind to YOUR opinion and theory that you are doing the very thing you condemn, which is to say that all must think and feel and conclude what YOU have or they are “uninformed” or do not “understand.” So it is you who are judgmental of others. And this is not a discussion … it is YOU posting at your whim and indeed telling people they are blind because of privilege. (“You might not see it, but that’s what privilege does.” see above) Which is interesting that you will not see what others do … who is the blind one? And PS, I’m not a male. What an interesting assumption. I agree and I usually stay away from it. Ugh. But someone today posted this on their IG account so I came to the website to see what it was about. The statement is insulting while saying that successful, comfortable people are the problem. This reminds me why I don’t pursue blogs. They are infectious with misinformation and, as you say, incites trouble. I do not get what is your problem with this post? Isn’t it true that most of the privileged people are apolitical? Isn’t it true that when they care (and get political) it is only to protect their privileged lifestyle? Your responses seem more apologetic than anything negative you think this post says about your “kind” (sic). Your life is nice and comfortable and safe in the expense of others. That is the system we live in. 25% in this planet lives above poverty levels and the other 75% suffers. That is a fact. Now if you feel guilt or not is your thing. But somehow I think that if you were ok, you wouldn’t bother to reply to this post. The commentary about being “sick of politics” is privilege in action was powerful, and a call to action. To put a finer point on that: Reading it challenged me to step up my game, if you will. I am a white, male, middle-aged university professor, which means that I am in a position to encourage twenty- and thirty-something men and women to think, reflect, and act. I have long felt an obligation to support students in sorting through ideologies, facilitating their critical thinking, and equipping them to make informed choices about where their leanings seem to be. But your commentary alerted me to narrow that sort of work to standard or mainstream ideologies only–i.e., those that comprise the “respectable” (for want of a better word) boundaries of right or left. Before reading your commentary, I might have quashed any dread or righteous indignation I may have felt when hearing a student, often naive or benighted, who espoused a position situated more at the extreme, specifically the extreme or “alt-” right. After reading your commentary, I will, where once I may have simply “agreed to disagree,” react with much more push-back to statements that are grounded in visions of or orientations to violence, bigotry, and unconscious privilege. Thanks for raising my consciousness about where my professional responsibility lies. Oh please. You believe that college students need MORE shaping their heads to reflect the nonsense of “privilege politics.” That ridiculous. Hello, I’m writing a post for my blog and would like to quote you with your full permission. Are you mentally challenged or just stupid? People are sick of politics thanks to zealots like you that make EVERYTHING political. The rest of us that actually have jobs and families to support don’t have the time or interest in advocating for such stupidy like getting boys into the girl’s bathroom, giving illegal immigrants voting rights, etc. Stop sucking Uncle Sam’s teat for handouts and become a productive member of society. Thank you for sharing this. As a privileged person I feel I have an obligation to work for justice every day. We all have to live on this planet together. We need to figure out how to get along and help each other. Maybe I am an activist out of quilt, but the rewards are great. I meet so many wonderful people and that gives me hope for humanity. I am a 25 year old black woman and I am tired of politics. Does this mean I am privileged? I am sick of politics because no one wants to listen to people who disagree with them. No one wants to exchange ideas in a calm manner. It’s much easier to make unfounded accusations against a person’s character. It’s much easier to misrepresent a person’s position than to understand it and respond to it accurately. It’s much easier to live in an echo chamber than to explore other peoples ideas and challenge them, and yourself. That’s why people are sick of politics, not because they are privileged and can “afford” too. Not because they have “interest”. The average person is sick of the “my way or the highway” attitude. You don’t need to be privileged to see the petty ridiculousness that American politics have become. Maybe this article isn’t about you? I realized that I was getting nowhere with most people I talk to who don’t already understand. I hedged a guess that it was because people frequently retreat (emotionally, intellectually, up to complete shutdown) when their world view is disrupted. So I started to lead off with something that initially came up as a closer…and now it either gets to the end of the conversation quickly, or – someone will start asking questions (the real goal). You cannot convince a stoically unquestioning person of anything. To them, that sky is literally purple in their view of the world. Privilege is how society treats you and has nothing to do with how you treat it. That idea (paraphrasingly) is along the lines of: Society alone grants privilege. You cannot earn it of your own volition and you cannot give it up until society has decided you no longer have it. Wow. Excellent post. Thank you! I saved this post on FB a few months back. I came back to read it again because I realized that even though I think I’m enlightened and compassionate that I’m completely clueless when it comes to self reflection. Last week I attended a black tie charity gala. I , (a white woman) sat next to a man (black) who was clearly successful in business, educated, connected, etc. As it turns out, we both live in the same city, which is educated, affluent, upscale, yet has the benefit of being culturally diverse. We started talking about how he moved to our city with his wife and kids a year ago from Boston, and he loved it. Unfortunately the school district is terrible. He tried sending his kids to the public schools and took them out after 3 months, now they are in private school. I then suggested they could just move to one of the neighboring cities who have excellent school districts. He looked at me like I was crazy. He said .”I can’t do that to my kids. I have a son who will be a teenager soon, and those neighborhoods and schools have zero diversity. That’s putting him in a dangerous situation”. I then realized those cities and schools have next to zero African Americans. It never even occurred to me that someone who seemingly “has it all” in fact doesn’t. That’s what privilege looks like. Yay me. This is such a powerful post and I am so disappointed with some of the responses. Hate, ignorant and some racist remarks and for what? Just someone expressing them self because of the way in which the system operates. Correct on every level and these responses – have proven the point of the post.